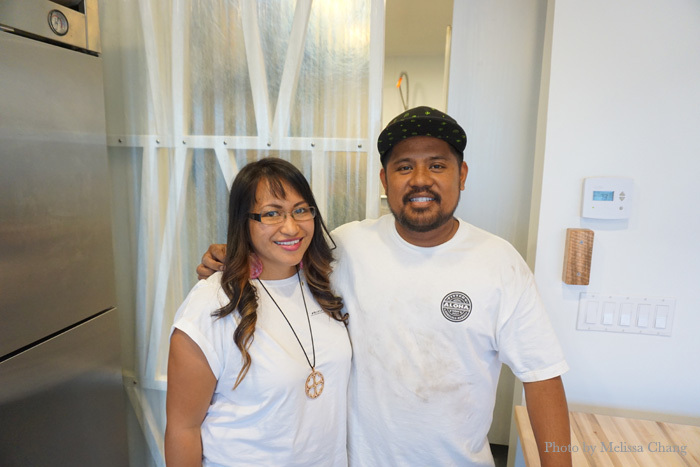 It’s been a long time in the making, but chef Sheldon Simeon of Top Chef fame has finally opened a place of his own, Tin Roof Maui, in Kahului. Janice and Sheldon Simeon in front of the door that she built. It really is his own. 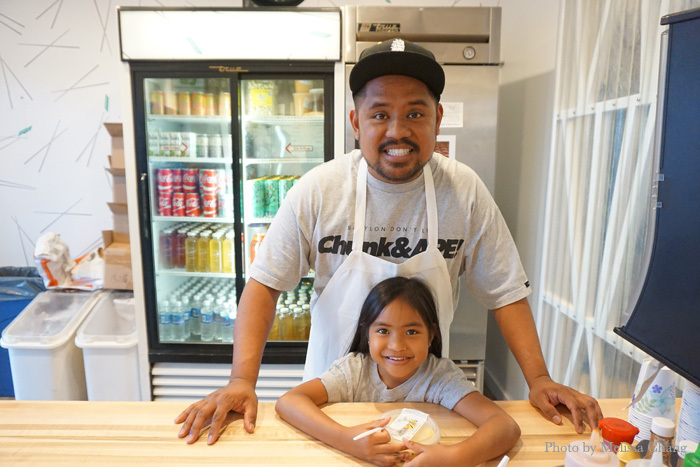 He and his wife, Janice, scraped their own money together and built their new shop themselves, living paycheck to paycheck and pouring in their own sweat equity. 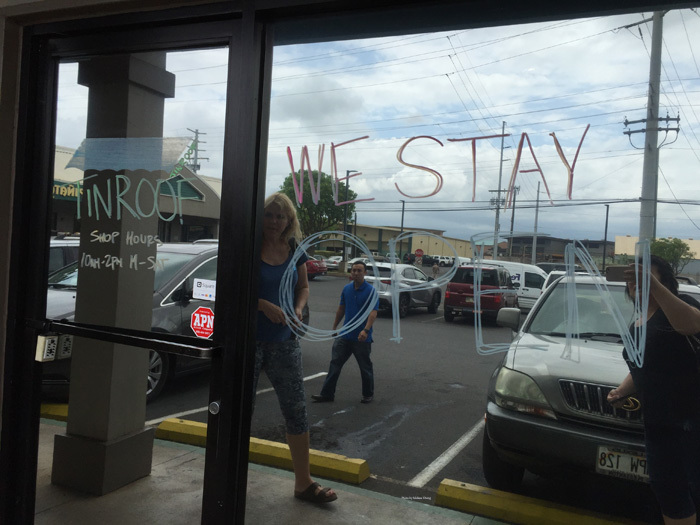 The name, Tin Roof, has meaning for the Simeons in two ways: First, it’s a nod to Sheldon’s home town of Hilo, where every home is shielded by a tin roof. Signage? No need signage! We stay open! Dea! 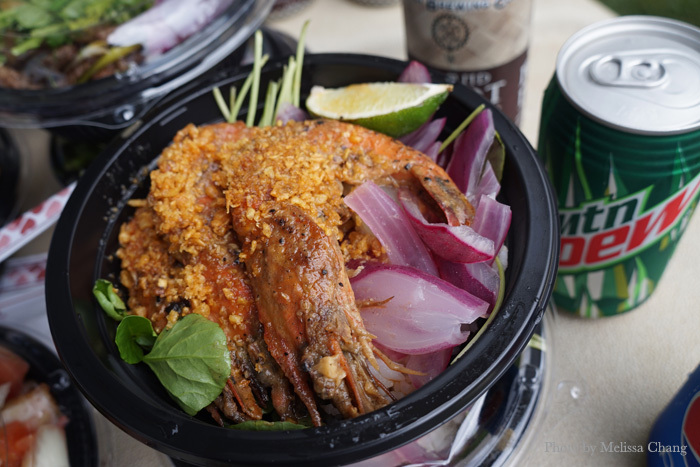 If you are familiar with the old Ko Ko Ichibanya location, just head there; although the address is officially on Papa Street, it’s on the Dairy Road side of the complex with warehouses, FedEx, and other little restaurants. You probably can’t see it from the street, since there’s no signage, but you’ll find this store front between U’i Gallery and Payday Loans. Sheldon with daughter Peyton at the counter. I recommend you go early, like at 10 a.m., before they open. We were lucky on the day we went; it was just before the lunch crowd at 11 a.m. and Sheldon was outside congratulating his daughter Peyton on her dentist appointment. We got up to the cash register, turned around, and — boom! — there was an instant line of 10 people behind us. Check out da daily specials, bu. 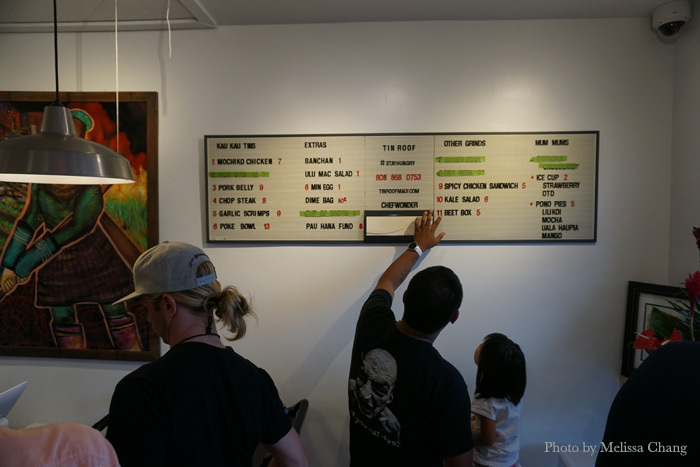 They built this restaurant for the community, to make their food approachable for everyone. 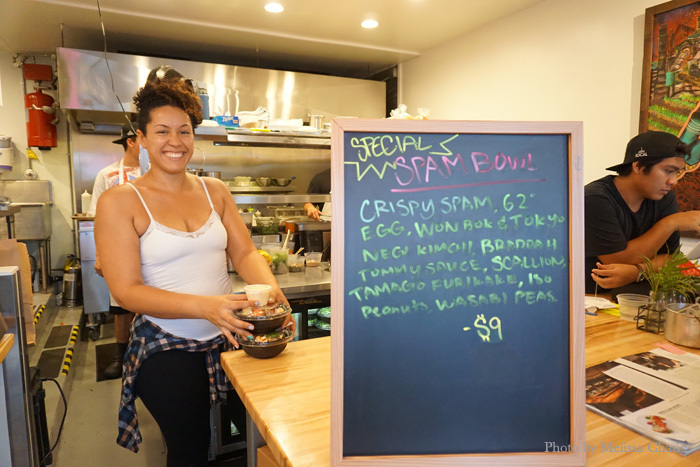 Thus, everything except the poke bowl is under $10, all local style items, but schmall kine fancy so you know it’s not just anyone’s lunch bowl. Da contents of da dime bag changes every week. Why is da dime bag 50 cents?! 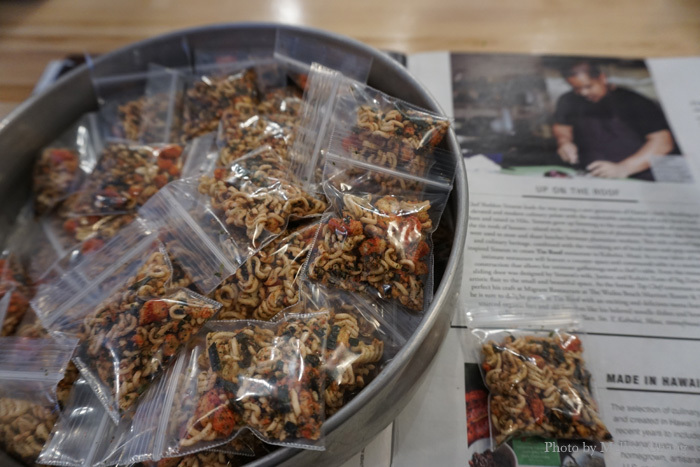 The dime bag is just a little bit of crunchiness and seasoning to sprinkle over your bowl to give it extra crunch and flavah. On this day, the bag had crushed-up chicken flavor Top Ramen, Flaming Hot Cheetos, sesame seeds, and furikake mix. 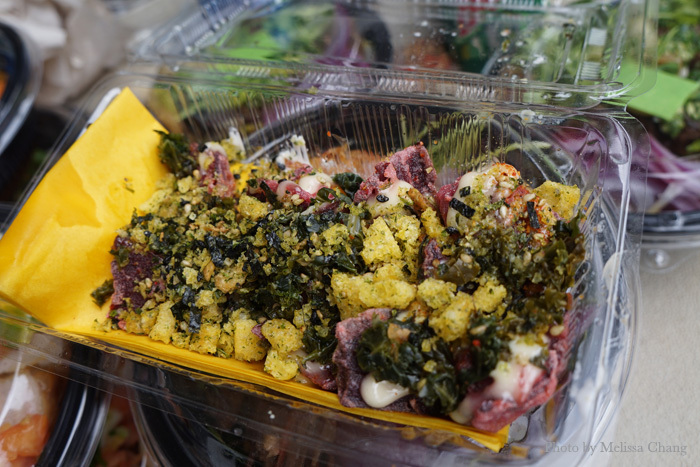 Other days, you might find furikake mix and chopped ika. Here’s the bowls we tried, all good, all pretty straightforward. The pickled onion gives each one a little oomph. Schmall kine. What are scrimps? It’s ebonics for shrimps. Or something. These are fried in garlic panko and sprinkled with fried garlic. This was different, in a good way. 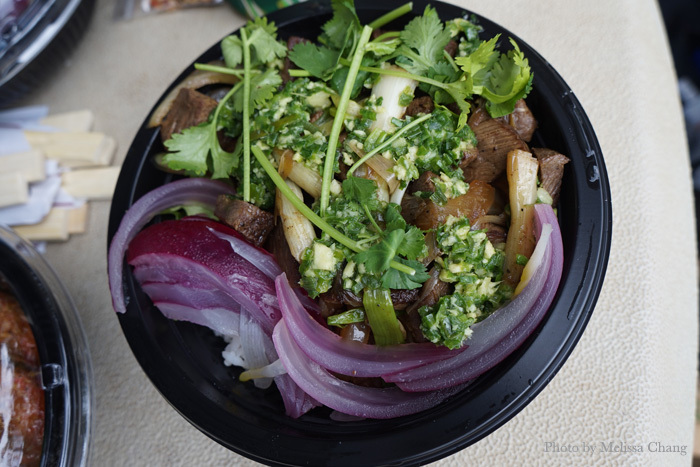 The steak had a ginger-scallion topping, like ginger chicken, and it made the meat very tasty! The fish always changes, so don’t expect your bowl to look like this. 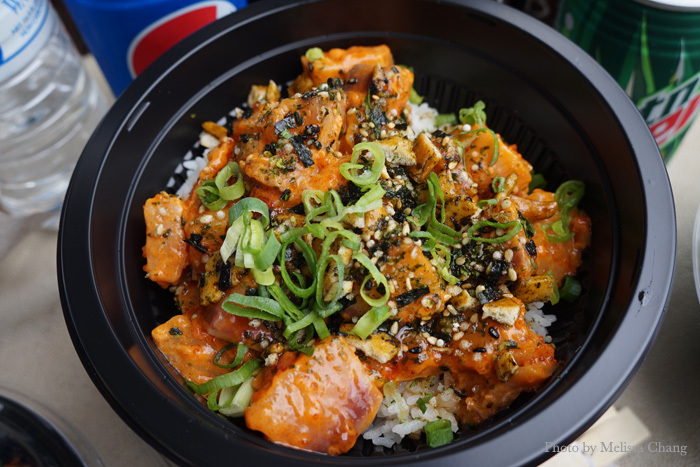 Ours was a spicy hamachi poke. Here’s one way to make you eat more beets: these are roasted, then fried, then topped with mayonnaise, furikake, and crushed Funyuns. 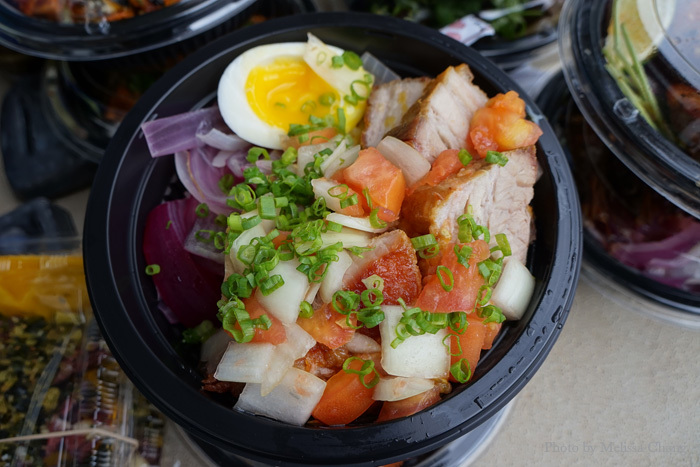 Think about it: You can have a cold cut sandwich for lunch, or one of these fresh bowls for the same price. I’d go with the bowls. But again, go early — not just to beat the line, but because when they sell out, they close for the day. Or better yet, just order online ahead of time!